I love having a random free weeknight where I don't really have anything to do. I mean of course there were things I should have done, like the laundry or cleaning the bathroom or something, but all of those things will still be there tomorrow. Instead of doing those things on my free weeknight, I made up an excuse to bake. I decided that my husband should have some baked goods to take to his co-workers. I wanted something that didn't require frosting since baking time + cooling time + frosting time would have been too much when starting at 7:00 pm. The other requirement was that I had to have everything on hand and not go to the grocery store. So I had to find something with less than 2 sticks of butter, less than 4 eggs, no sour cream, no heavy cream, no buttermilk, etc. Well, I browsed through my Magnolia Bakery cookbook and when I got to the muffin/breakfast bun section, I knew I wanted to make some sort of coffee cake type dessert. I did have a package of cream cheese in the refrigerator, so this recipe was the winner. And winner it truly is... don't be put off by the fact that I picked the recipe by process of elimination of ingredients because these little muffins are delicious. The gooey filling is perfect and the cake has a great light texture. 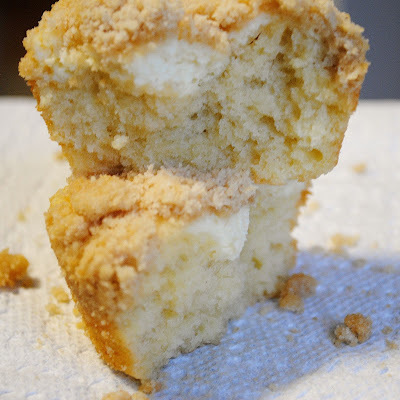 I added a little cinnamon to the streusel topping and a bit of extra vanilla to the batter, both of which I would recommend doing again. I also cut the recipe for the topping as I ended up with way more than I needed. This recipe does require three separate processes to make each part but they all come together really easily - the only downside is the couple extra bowls you have to wash. Watch the cooking time carefully so you add the filling at the right time. Preheat oven to 350 degrees. Spray 16 muffin cups with baking spray or butter and lightly flour. Cream together cream cheese and butter until light and smooth - about two minutes. Add sugar, egg yolk, and vanilla and mix until well incorporated. Set aside. Combine flour, sugar and baking powder in a medium bowl. Add butter pieces and toss to coat. 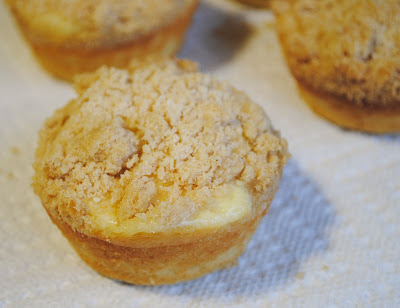 Using a pastry blender or two forks, mix in butter until the mixture resembles coarse crumbs. Set aside. Combine flour, baking powder and salt in a small bowl and set aside. Cream shortening and sugar in a large bowl until light and fluffy, about two minutes. Add eggs, one at a time, mixing thoroughly after each addition. Combine milk and vanilla in a measuring cup. Alternately add 1/3 of the flour mixture and 1/2 of the milk mixture, beginning and ending with flour, beating on low speed until just incorporated after each addition. Use a scoop to transfer batter to prepared muffin tins, filling each about 1/2 full. Bake 10 minutes and remove pans from oven. 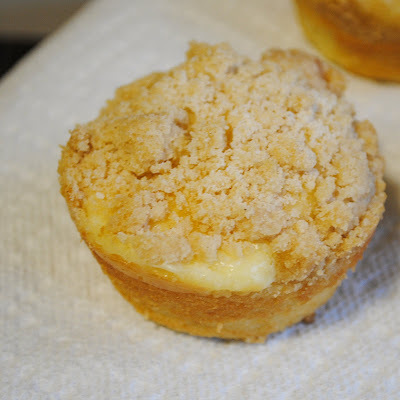 Add a spoonful of cream cheese filling to each muffin, pressing lightly with the back of the spoon. 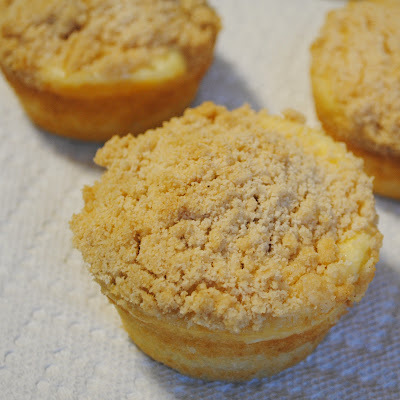 Top with a spoonful of streusel topping, filling each muffin cup to the top. Bake an additional 14 minutes and remove. Cool about 15 minutes and use a knife to loosen slightly and continue cooling. Cool completely or serve slightly warm after about 30 minutes. I made blueberry muffins with a cheesecake filling and they were a hit. I will have to try your recipe soon! @Maria - Just looked up your post on those - they sound great. I absolutely love blueberry muffins. Yum!!! These look great, I've gotta make them! I love coffee cake! Um, hello lover. These look amazing and now I have to find an excuse to make them. I can't wait to make these! They look totally fabulous! OH Lawdy, Lawdy... I LOVE anything with a cheesecake filling. These look totally delicious and addicting! Thanks for sharing :) I look forward to trying them very soon. Oh my... I love anything with cheesecake or cream cheese... and pastries are definitely the ticket to any satisfaction for me!!! These muffins look delicious!